You're here, having learned how useful PieSync is for syncing the data between your apps, and would like to set up your first sync. Let's see how you can get it running! In PieSync, click "Connections" (bar on the right), and then click the blue button "Add a New Connection". Select Woodpecker and your other app in the list (use the search bar to find them quickly). Type in part of the name in the search until you see the app in the list. Click the app in the list to select it. Get the API keys from Woodpecker and your other app, and give them to PieSync. PieSync needs these keys to gain access to the apps' databases, which it will manage for you. Click "Settings" from the dropdown menu in the upper right corner. Click the "API Keys" tab. Click the green "Create a Key" button. Click the API key and copy it to use in PieSync (see below). Note: This step will vary from app to app. Google Contacts, as one other example, only requires you to pass through a login/access prompt to get it running; there is no API key to copy in its case. Now, use your API keys (or otherwise login into the app) through PieSync. To authorize an app, click the authorize button below it, and paste its API key into the dialogue box, then click "Next". When that's done, click "Configure the sync between [your other app] and Woodpecker". Here's where you can configure the sync, setting up specific tasks for PieSync. Choose if you'd like to sync the data in your apps both ways, or if you'd like to only sync it from one to the other. Add filters to have the sync fire when specified conditions are fulfilled. For example, select has no Deals to only sync prospects with no deals in Pipedrive. Add actions to have PieSync perform additional tasks when syncing. For example, select add Tag, and type in the tag that should be added (like "New") for the newly synced prospects in Woodpecker. If syncing the apps both ways, you can now add filters and actions to apply when syncing from the second app to the first. Simply repeat the steps listed above. Use PieSync's simple interface to set up the filters and actions you need. When setting up a two-way sync, it’s very important to decide which application takes precedence when PieSync finds differences in data. For example, if Woodpecker lists a phone number for a given prospect as 12345, but in your other app the phone number for that same prospect is 13324, one "version" will have to overwrite the other. You need to decide which app will "know best" and have the correct data when such differences are detected. If Woodpecker “wins”, it will overwrite conflicting data in Pipedrive. If Pipedrive “wins”, it will overwrite conflicting data in Woodpecker. Surprise: the default field mappings are already configured by PieSync. For example, Organization Name (in Pipedrive) is mapped to Company Name (in Woodpecker). 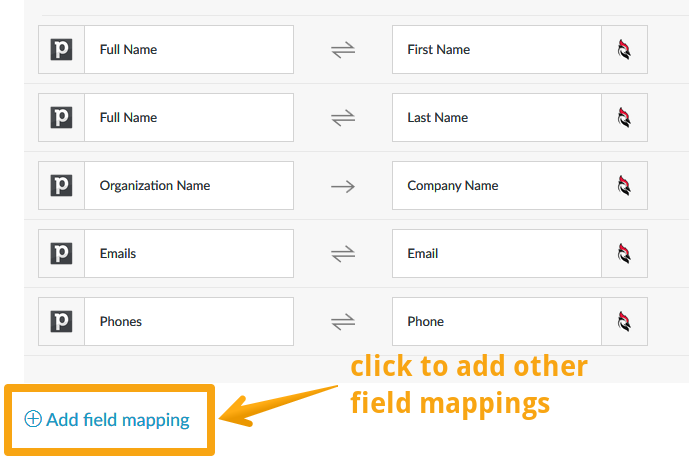 You can set up additional, custom mappings for other fields by clicking "Add field mapping" right below, and selecting the fields from both apps. You can add custom mappings by clicking "Add field mapping". All that's left to do is to click "Start syncing now!" That's it, you now have database maintenance between these apps off your shoulders! You can review and change any of the above settings at any time, by editing your sync task in PieSync.